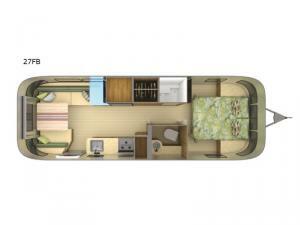 Kick back and relax in this Special Edition Tommy Bahama Relax Edition 27FB travel trailer by Airstream RV. Your island getaway starts in the bedroom with a pillow top memory foam mattress covered in Egyptian cotton bed sheets and sleeping/decorative throw pillows. You will be blown away by the kitchen's features like the bar with storage for glasses, a stainless steel Kohler sink, and a Baraldi cooking vent with light over the stainless steel three burner cooktop. There is also a booth dinette to enjoy your meals at and designed with a custom laminate top and Ultraleather seating, which can also be turned into a sleeping area. At night, you can choose to either keep the night rolling underneath the power patio awning with LED dimmable lights or head inside and watch a movie on the Samsung LED HDTV.